My running partner today has been by my side for over fifteen years, and has pounded the pavement with me since we started training for our first half marathon just a short two years ago. We’d been running off and on prior to that — we’ve always been active, but I felt I needed something to work for — and the BFHAG (big fat hairy audacious goal) of finishing our first half in April of 2011 was just the ticket. In those two years and thirty pounds later, I’ve run four more, among countless 5 and 10K’s, and am planning to complete three half marathons around the Midwest again this year. We found ourselves in Manhattan almost five (gasp) years ago after living in three other Big 12 college towns. As it was with my husband’s job in college athletics, moving up also brought moving on to another school, which is how we landed here. Now, while college athletics is behind us, we were fortunate to stay in a community we’ve come to embrace, although I don’t know I will ever call myself a Wildcat. More like a lone Cyclone in a Wildcat town. Except fewer cowboys. Unless you’re from Oklahoma State. More bad Big 12 jokes to come. Manhattan is a quintessential college town. It’s quiet in the summers and over extended university holidays. It revolves around football, basketball, Bill Snyder, and over dinner in the local restaurants, topics often revolve around harsh words about the KU Jayhawks. In the heart of the Flint Hills prairie, our runs are often planned around the windiest parts of the day, or you’ll surely lose whatever hat or visor you were thinking of wearing–those headwinds can put any eight-minute miler to shame. But the views are immaculate and as wide and far as you can imagine seeing. Yes, we’re in flyover country, but it’s charming and beautiful in ways that the coasts can’t compete with. We started our run near our home–a charming rancher at the top of the hill near campus with a secluded backyard and plenty of wildlife–a rare sight in the middle of town. From here we hook a couple of quick turns up another hill, where we make our first stop at my second home in Manhattan. I don’t know the person I’d be without the yoga community at large and the practice we share. We laugh, cry, handstand, travel and dream together, and it’s a family I love sharing my life with. (And there’s always the benefit of the relief my hamstrings get after a ten-miler!) Two people that get specific thanks for introducing me to yoga: Jessa and Ali — without you two, I would never have experienced the clarity and grace the asana brings. 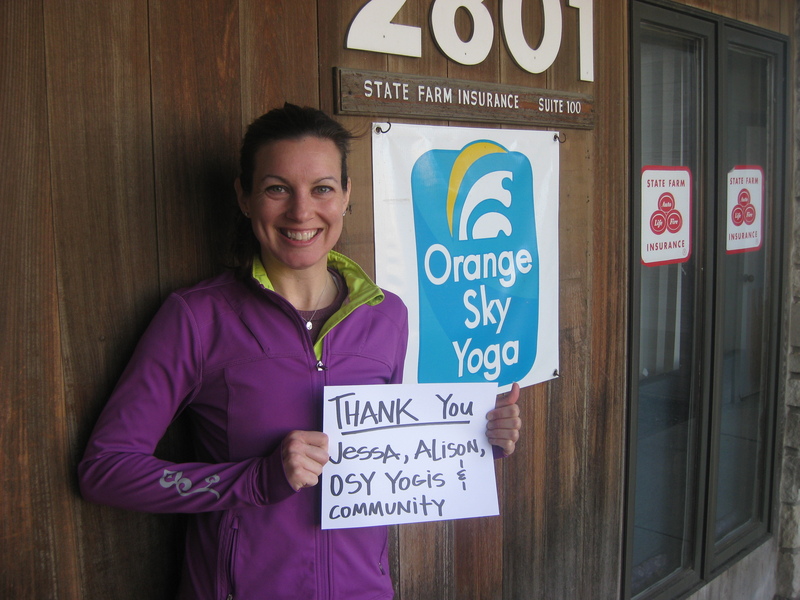 For the people I’ve been fortunate to meet through yoga, and the practice we share, I am deeply grateful. From this corner we turn north on Browning and fly down the hill to our next turn and back up the hill, heading east toward campus. At the corner of Denison Ave and Jardine Drive we stop at one of the most diverse neighborhoods in the country — Jardine Apartments. Originally constructed for married university housing, it’s now home to more than 1500 residents from nearly 50 countries. The setting itself feels like a small campus right next to Kansas State University. 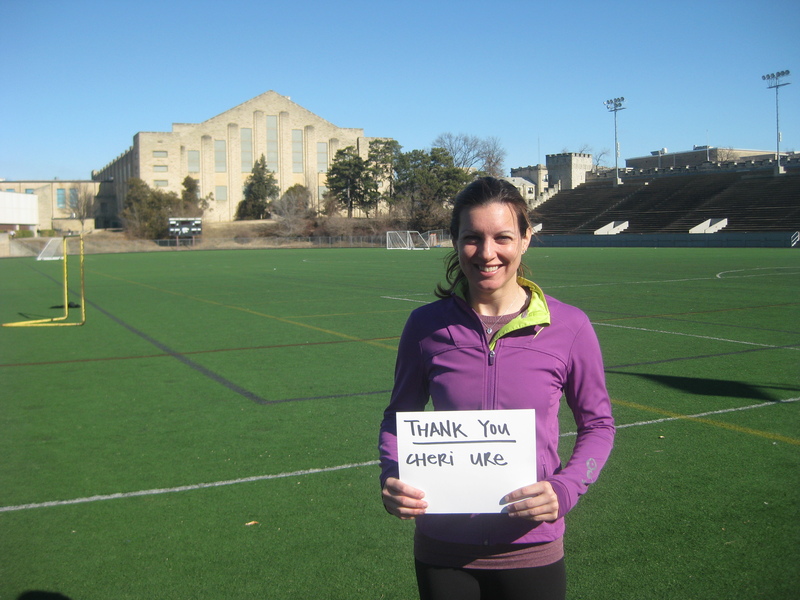 It backs up to K-State’s home for basketball and football, which is apropos for our next thanks. Here, we make our second stop. The next thanks goes to our dear friends, who are our chosen family. They’ve been part of our lives since Mike and Missy worked together in Marketing at the University of Kansas, as we planned a wedding and fumbled around to find ourselves among the reality of a first real job. Many miles have separated us a time or two, but our friendship is a constant and we love to have an excuse to go to Kansas City for a day or quick overnight to visit them. We have long forgiven them for being Wildcats, (although they do have a little Iowa State lineage in their extended family) although that’s taken a lot of wine and tolerance. We have run most of our half marathons together, and the unfortunate lone adult who decides not to run is in charge of watching the kids. Sucker! We continue on a bit and start to head southeast through the Kansas State University campus. The university is much like Iowa State — lots of engineers, veterinarians, and dually-drivin’ agriculture majors — and good, warmhearted, Midwestern attitudes. Our route skirts the campus on the east side and begin to head south to the flattest part of our run, and make our way toward Aggieville. Named back around the early 1900’s, when the school mascot was the Kansas State Agricultural College Aggies (take that, Texas A&M! ), it’s been the favorite hangout for after-class and Saturday night revelries. If you’re lucky you’ll even share a cocktail with Eric Stonestreet of Modern Family. However, no visit to Aggieville is complete without stopping at Varsity Donuts. Open just shy of a year and a half, it has developed a cult following with its quirky flavors and awesome people. You just don’t visit Manhattan without indulging in a Party Girl or Flat Tire. On football Saturdays, the line is longer than those at the watering holes next door. They’re that good. 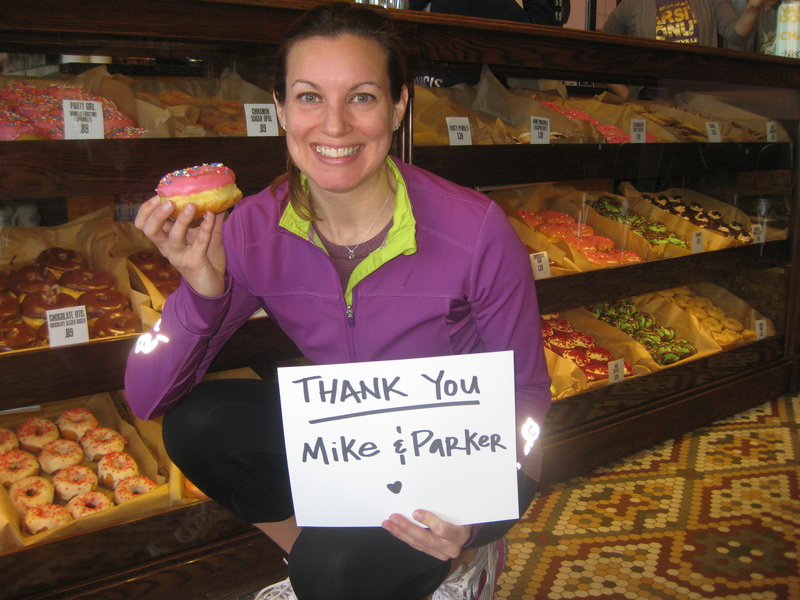 Here, I’m going to thank Parker and Mike—they love Varsity Donuts the way I love them and you’ll find them there every Saturday morning. Sometimes life with my spouse and favorite six year old is salty sweet like a Maple Bacon bar, other days it’s the fun and games of a pistachio donut, and other still it’s everyday Otis or glazed. Yes, I just compared my husband and child to donuts. They are sweet, fun, and I just can’t imagine my life without either one of them. 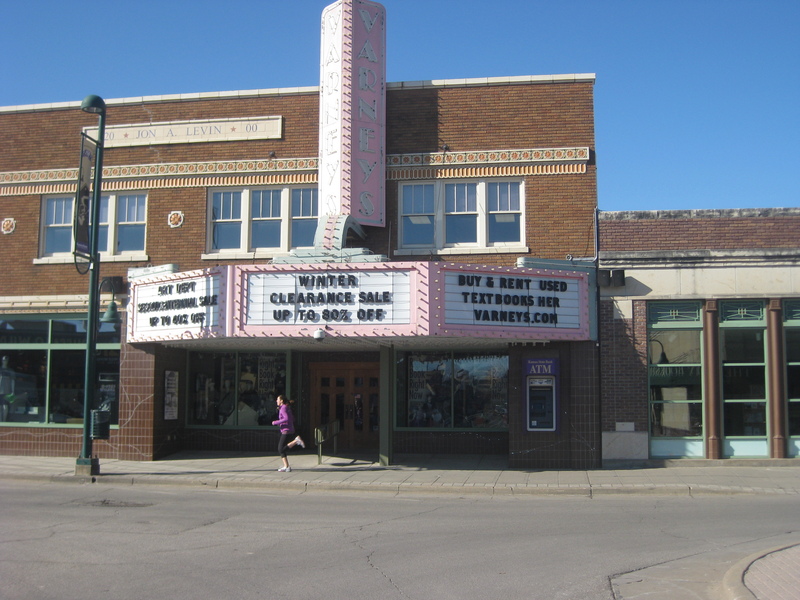 From here we cruise through Aggieville, past the iconic Varney’s bookstore, and head around City Park, a place where we often bump into other running friends and families we know. Manhattan is just small enough that most of the runners know one another, and it’s not uncommon to have someone honk and wave as they’re driving by. It’s the best kind of encouragement one could ask for. 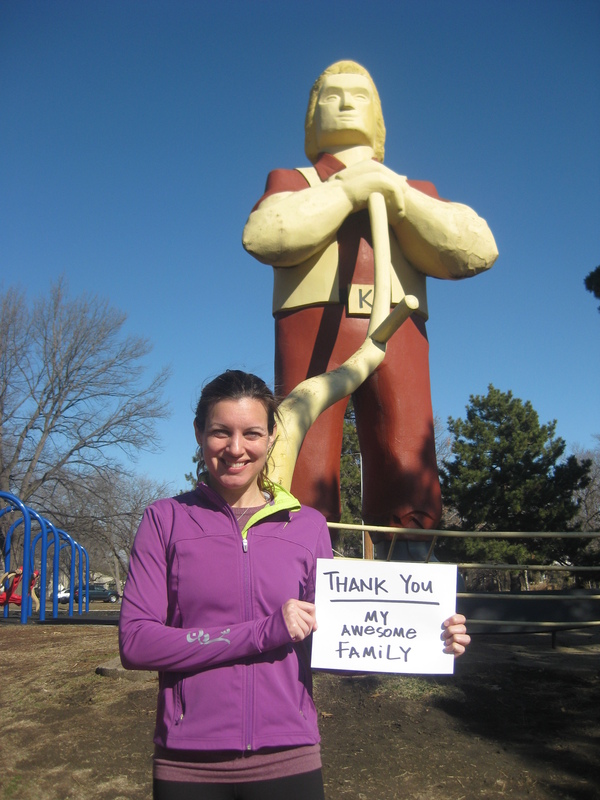 At the southeast corner of City Park, Johnny Kaw is a giant statue and an icon of Manhattan. (At thirty feet high, he’s hard to miss.) Move over, Paul Bunyan… we’ve got our own “fakelore” here. He’s the mythical character of a Kansas settler who planted wheat, invented sunflowers, and supposedly wrung out the clouds to end a drought our two. His storied pets of a wildcat and a jayhawk rarely got along, and the results of their rumblings is also known as the Dust Bowl. Obnoxious, perhaps, but iconic, sure. This thanks is a huge shout out to my awesome family. I wouldn’t be where or who I am without the foundation of these people behind me. They are my greatest cheerleaders and the first text after finishing a big race. To say thank you doesn’t seem enough for the sacrifices they’ve made and love they unconditionally have, no matter the situation. There aren’t enough words to express my gratitude for them. We turn the corner to head west up Poyntz Avenue, another thoroughfare and a long, slow, uphill on Seventeenth Street, where we head back north toward Anderson Avenue. 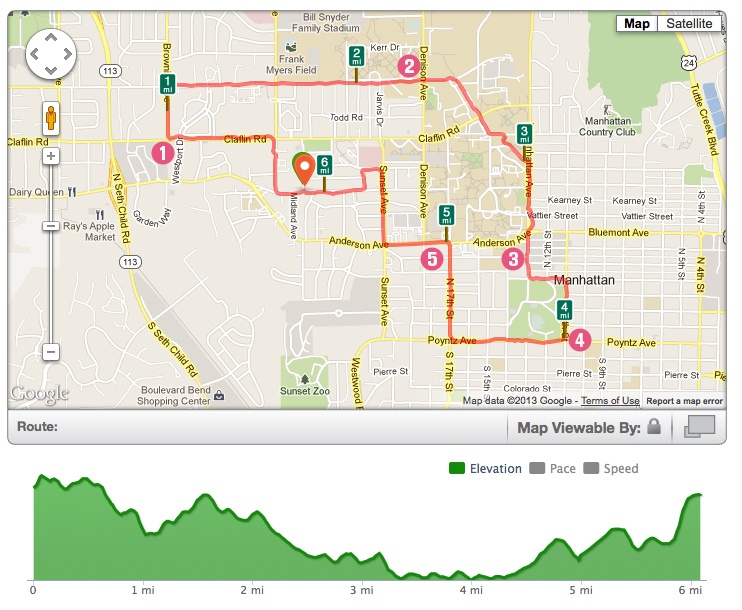 There are few flat places in this city, although most of my routes somehow manage not to include them. At this corner we turn west again and stop at Memorial Stadium. From 1922-1967 it was home to KSU’s football and track and field teams before Bill Snyder Family Stadium was built. Since then the field has been replaced with FieldTurf and used for soccer, marching band practice, and my last thanks of today. This instructor sat me down early in my sophomore year at Iowa State, look me in the eye and tell me that I needed to change my major because it was nearly impossible to make a career as an artist. That conversation makes my heart pound and eyes sting to this day, over fifteen years later, and to her and the others who said it wasn’t possible I want to say to them… watch me. 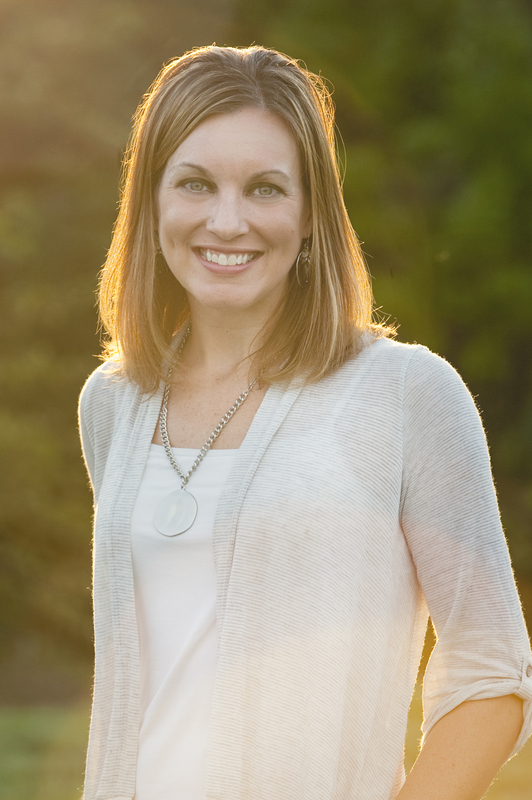 In the five years that I’ve built my photography and design business (editor’s note – you should check out her work, she’s good), after learning everything I could during my nearly ten years in ad agencies, I can’t say it’s always been easy. Some days it’s as much of an uphill battle of balancing art and business as it is taking some of these stairs you see behind me (and I pound them often—it’s one of my favorite workouts) run with grace and speed. But I’m the person who won’t back down because you say I can’t; it will only inspire me further to succeed, and for that motivation, I have to say I’m finally grateful for those hurtful words. Our route turns a bit to make the horseshoe back toward College Heights Road and back up the hill to where we began. I call it the “glory lap” since it’s where we pick up steam toward the finish. I’m honored and humbled and terribly grateful to be part of this project–a huge thank you to Steve for including me and giving me a platform to pay it forward to others. Keep on running! I’m excited to uncover this website. I want to to thank you for ones time for this particularly fantastic read! !